I spent Thanksgiving afternoon with my immediate family (we always do Thanksgiving lunch), Thanksgiving dinner with Jasons’ family and did Thanksgiving prime rib style (so good) Friday night with his friends. I’ve been looking for the perfect flannel for the longest time, one that I can wear buttoned up or open with a tee underneath and figured this primary colored flannel would be appropriate for the season. I don’t shop at J.Crew often but the soft material may cause me to become a more frequent J.Crew shopper. Anyways, I hope everyone else’s Thanksgiving was as food filled as mine! This look is really beautiful! Love that jacket. 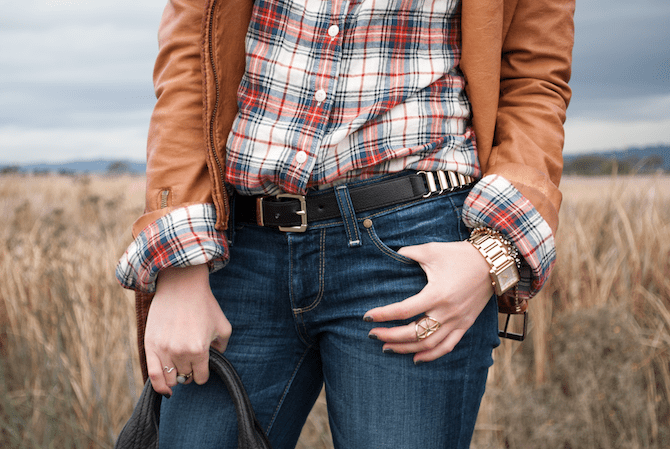 LOVE this awesome outfit – the leather brown jacket and plaid go so well together! Great look, I really love the color combination and that heels is such a killer. I love flannel for fall! Great look, loving your style! you look fawless dear, beautiful pictures too. Nice blog honey! Your style is simply amazing!! I'm now following you, too sweet girl! Love this outfit. I am obsessed with you style. Your layering is amazing! Love your blog & this outfit! You are gorgeous! Would you like to follow eacother on Bloglovin' & GFC? If you want to let me know, will follow straight back.